Is Stress Making you FAT ?? Are you training really hard?? Are you seeing very slow if any progress in your fat loss ?? The answer is NO!! But why?? Our lives are a constant battle between stress production and stress relief. When we undergo stress, our bodies are fully prepared to deal with this by virtue of a hormonal cascade, in which stress hormones are released by the body in situations which are perceived as being potentially dangerous. Stress hormones such as cortisol and epinephrine act by mobilizing energy from storage, increasing heart rate and blood pressure and shutting down metabolic processes such as digestion, reproduction, immune function. For example the bodys natural fight or flight response. An event occurs to trigger a surge in epinephrine (adrenaline), the last thing we want to do is eat, as blood flow is moved away from internal organs to the brain and limbs to effectively either take on the challenge or run away. Stress can come in many forms, some of which are controlled such as training, drinking/partying , calorie restriction and general day to day activities, others are imposed upon us such as sick kids, meeting deadlines for college, pressure in work, financial pressures and the list goes on. As ive previously stated, the body is built to deal with stress, but, stress is meant to come to be dealt with and go, acute stresses. The problem arises when the body is constantly bombarded with stresses and is unable to keep up its recovery. Chronic stress. Think of it like a bank account , youre working every week to make lodgement. This is general day to day living. Extra stress means money coming out of your account , but the body is still earning enough to keep your head above water. But suddenly the stresses ( money spent) begin to outweigh the bodys ability to recover ( money earned) and we dig further and further into debt. 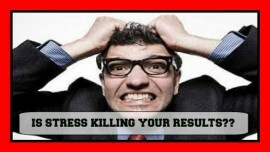 This is chronic stress and leads to excessively high levels of these stress hormones. So how does this derail our fitness and body transformation progress?? Gonadal dysfunction meaning lowered testosterone in men and impaired prolactin and estrogen production in women meaning messed up or non-existent menstrual cycles. As you can see there is some pretty negative things happening during times of elevated stress that can work against everything you are trying to achieve. Some directly and others that will actually take precedence in the bodies hierarchy. Do you really think the body wants to lose fat and build muscle if its internal environment isn’t working as it should and it feels under pressure to survive?? Of course not. Your body has no need to be lean and muscular and toned, so from the outset it is a battle to try and achieve the body we want. So if we are training really hard and in theory eating below maintenance calories but still arent shifting bodyfat and building lean tissue, is training more and eating less gonna fix things?? Probably not. And just as this chronic elevation of stress hormones lead to our current situation over a period of months or even years, don’t think a few weeks of doing things right, with reduced stress and improved recovery is gonna fix everything and get us lean and toned. This process could take a period of months or even a year, depending on how badly the individual is affected.